Manufacturer and Trader of Germicide Cleaner For Food & Beverage & Dairy Industry, CIP Caustic Additive For Food & Beverage & Dairy Industry and CIP Cleaning Chemical For Food & Beverage & Dairy Industry offered by Chemtex Speciality Limited, Kolkata, West Bengal, India. The web server used by Cleaning-chemicals.net is located in New York, USA and is run by Voxel Dot Net. There are many websites run by this web server. The operator uses this server for many hosting clients. In total there are at least 249 websites on this server. The language of these websites is mostly english. 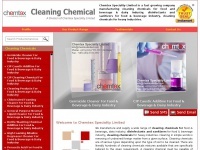 A Apache server hosts the websites of Cleaning-chemicals.net. HTML 4.01 Transitional is used as markup language on the webpages. To analyze the visitors, the websites uses the analysis software Google Analytics. Indexing the data of the website and following hyperlinks on it is explicitly allowed by robot information.